Which Fruits & Vegetables Strengthen Bones? Most people think of dairy when they think of foods good for bones and teeth. While it's true that dairy is an excellent source of bone-building calcium, it is not the only nor best source of this important mineral, according to the Harvard School of Public Health. Certain vegetables provide calcium as well as vitamin K, a nutrient equally important to bone health. Both vegetables and fruits promote bone health by neutralizing blood, which helps reduce calcium excretion and related bone loss. To build and maintain strong bones you need adequate amounts of calcium, vitamin D and vitamin K. These three nutrients work in conjunction to build and repair bones, with vitamins D and K playing a central role in calcium absorption. Food sources of vitamin D are few and do not include fruits or vegetables. Green vegetables are the primary source of vitamin K and also provide calcium. Examples include kale, turnip greens, broccoli, Brussels sprouts, parsley, green onions, lettuce, asparagus, okra, peas, watercress and bok choy. The China Study, a collection of research studies beginning in 1983, found that Asian people suffer from fracture rates at a significantly lower rate than people who live in countries with high consumption of cow's milk. 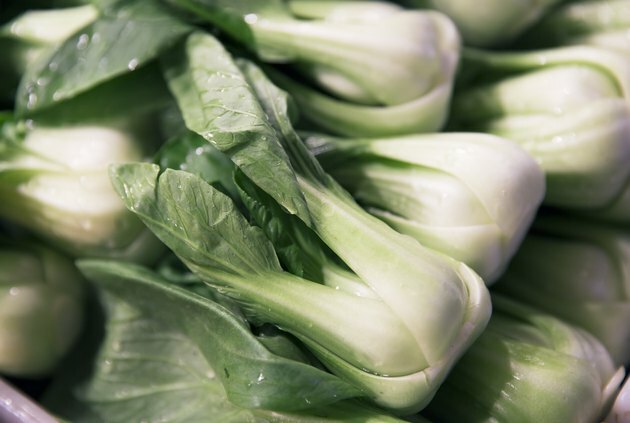 Asian cuisine rarely includes dairy but does include plenty of green vegetables—especially bok choy, broccoli and cabbage, which provide vitamin K and calcium. Some vegetables that contain calcium are not good sources of the mineral, according to the Harvard School of Public Health. This is because they also contain oxalic acid, which blocks calcium absorption. These foods include spinach and Swiss chard. Vitamin-K-rich collard greens and kale are better choices for calcium. When your blood becomes too acidic, the body borrows calcium from the bones to neutralize the blood. If this happens frequently—and you don't consume enough of the bone-building nutrients, calcium and vitamins K and D—your bones may become brittle and weak. To help your body maintain its pH balance without borrowing calcium, consume plenty of fresh or frozen fruits and vegetables, most of which have a natural alkalizing effect. The American Medical Association lists increased energy as one of the benefits of a healthy diet rich in fruits in vegetables. If you have more energy, you may find yourself becoming more active. Weight-bearing exercise—such as walking or dancing—prevents age-related bone loss and may increase bone mineral content in some people. Women with adequate calcium intake can expect greatest results from exercise, according to Public Health Reports. What Are the Benefits of Cholecalciferol?